Recently while working on a NSX design we decided to use LAG from the ESX hosts to the ToR leaf switches. After configuring LACP in active mode on the physical switches we moved on to configure LACP on the distributed virtual switch. 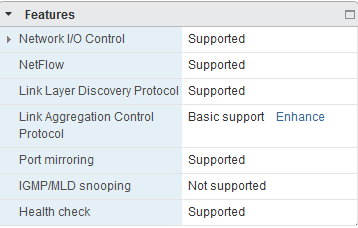 All LACP configuration for the VDS has to be done from the vSphere WebClient but looking at the WebClient we could not find the LACP option on the VDS. After some digging around we figured that the distributed virtual switch was created using the VMware C# client. A distributed virtual switch created from the C# client has only basic support for LACP. To use advanced LACP options click the “Enhance” option in the distributed virtual switch features box from the vSphere WebClient. This allows us to choose the load balancing algorithm, LACP mode and also creates the link aggregation group with the ESX uplinks. LAGs are represented as uplinks in the teaming and failover policy of distributed ports or port groups. You can create a distributed switch configuration that uses both LACP and existing teaming algorithms on different port groups. Multiple load balancing options for LAGs.